The Kreg® Classic 2" Face Clamp is a great tool for Kreg Joinery and a variety of other tasks when building wood projects. This compact clamp features an extra-large clamping pad on one arm to distribute clamping force evenly. This extra-large pad is placed on the "show side" of the joint as Kreg Screws are driven during pocket hole assembly. 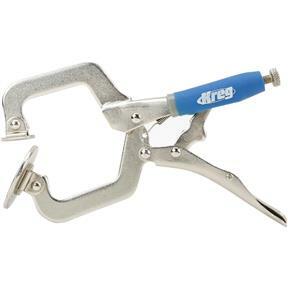 The Classic 2" Face Clamp is also compatible with the Kreg Jig R3's Portable Clamp Adapter so the jig can be connected directly to the clamp for one-handed positioning of the jig while drilling pocket holes. Ergonomic padded grips offer increased comfort and ease of use. This Classic 2" Face Clamp features a 2" (51mm) reach and clamps materials up to 2-1/4" (57mm) thick.